The blog has resurfaced! I’m 2 months into life here in Sydney, and it’s been pretty full on — but fun, living with a fabulous couple who’ve become new friends (cheers Jenna & John), getting to know my new colleagues and city, with weekends spent taking off in a rental car to find a home, choose schools, finally welcoming the family after 6 weeks out here, and now unpacking as our boat has come in with all our worldly possessions. Just the dog to join us now! The new Connected Intelligence Centre (CIC) sits in the Office of the Deputy Vice Chancellor & Vice-President (Education & Students), Shirley Alexander. 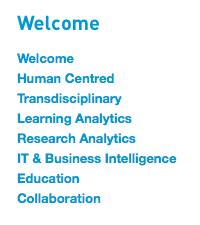 We’ll be working closely with the stakeholders in each learning analytics system we develop. A lot of the last 8 weeks has been shaping and testing with colleagues the narrative for CIC, reflected in the website which has just launched. I’m sure this story will be in perpetual beta, and I look forward to comparing notes with colleagues setting up similar learning analytics centres. Check out our mission, news, events and jobs, and follow us on twitter to track how things unfold.